Following Islamabad’s diplomatic success at the UN when the 49-page report published in June 2018 by the Office of the UN High Commissioner for Human Rights (OHCHR) – which covered a short period between July 2016 and April 2018 – took a more critical view of the role of the Indian army for its violation of human rights in Kashmir, Pakistan is now poised to seek enforcement of UN Security Council resolutions on the Kashmir issue to peacefully settle the bilateral dispute (the UN Security Council resolution of 1948 stipulated holding of plebiscite in Kashmir either to join India or Pakistan and other resolutions were conceived to facilitate the process). While the Imran Khan leadership is reportedly working out a proposal to resolve Kashmir issue with an intention to forge ahead Indo-Pak relations, it is perplexing that Pakistan’s envoy to the UN Maleeha Lodhi has raised the issue at the UN seeking a peaceful settlement of the dispute in accordance with relevant UN Security Council resolutions. These palpably contradictory gestures seem to be desperate and diversionary moves motivated to divert public attention from the enveloping economic crisis that Pakistan is hard-pressed to wade through. Notwithstanding the UN report’s critical view of the activities of Indian forces in the Valley, the Kashmir puzzle not only presents a much complex scenario with incessant violation of human rights by various militant groups in the garb of ‘freedom struggle’ masquerading cross-border terrorism supported by Pakistan leading to gradual erosion of Pakistani image within the international community, the Kashmir issue has been recognized as a bilateral issue by major actors of world politics and the demand for holding of plebiscite as per the resolutions of UN Security Council has run out of steam with passage of time and given certain developments. Plebiscite has become an unworkable proposition following alleged instances of a rising tide for independence within Kashmir and Pakistani recurrent rhetoric of extending support to the independence of Kashmiri people gained currency. Therefore, the UN Security Council resolution which endorsed holding of plebiscite offering the Kashmiri people two choices either to join India or Pakistan is not in sync with the evolving context. Second, even if Kashmiris are given an option of independence, problems still remain. 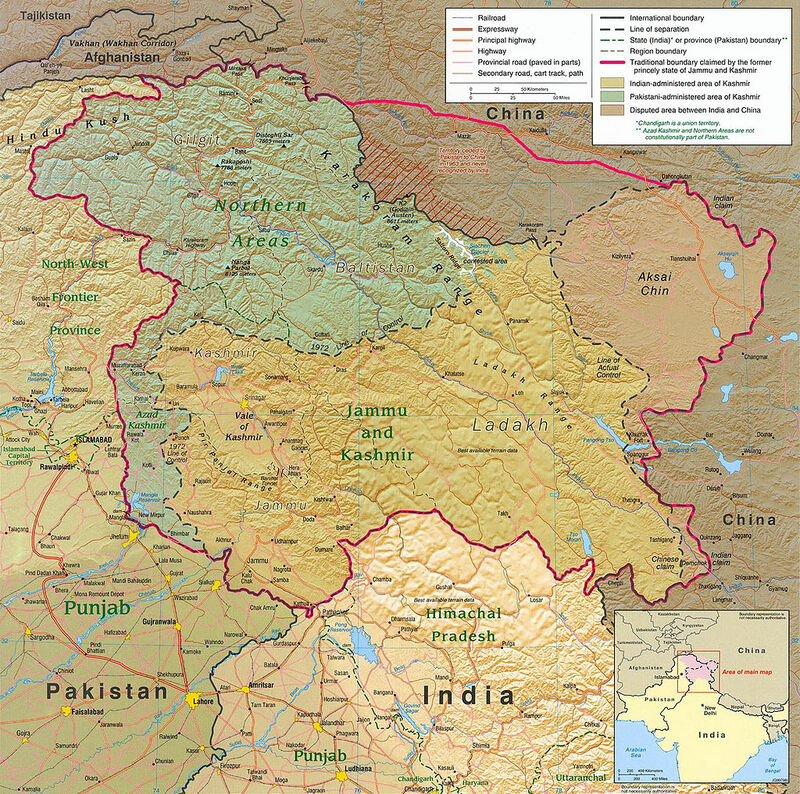 For instance, ‘Pakistan-administered Kashmir’ or ‘Azad Kashmir’ or ‘Pakistan-occupied Kashmir’ whichever terminologies may be used to define the geographical area but the fact that cannot be altered is the area is as much disputed as the Kashmir Valley. India’s objection to Chinese ‘Belt and Road Initiative’ on the ground that it passes through the disputed area substantiated this argument. It is unclear, however, whether Pakistan would invite plebiscite in this disputed area as well. Third, due to growing radicalization within the Kashmir Valley, many Kashmir pundits have been forced to leave their abode and settle in other areas. Until they are rehabilitated any idea of the plebiscite would be an injustice to the rights of the natives. Fourth, India has cited successful conduct of elections in the Valley as a source of its continued legitimacy which has been very often criticized by Islamabad by implicating the Indian army not only in muzzling the voice of Kashmiri people but also rebuffing the role of media in manipulating information. The way the international image of India and Pakistan evolved also contributed to their soft power and claims on disputed areas respectively including Kashmir. Despite many socio-economic and religious tensions prevailing in many pockets of its territory, India has been able to sustain itself as the largest functioning democracy in the world. The division of British India into India and Pakistan was materialized on the basis of a ‘Two-nation theory’ endorsing the idea that Hindus and Muslims formed two nations and be allowed to have their own states. Notwithstanding this theory of division, secularism became one of the guiding principles of India’s democratic governance and enabled it to survive as the largest democracy in the world for the last 70 years despite religious, cultural and linguistic divergences. India became home to the second largest Muslim populated country next to Indonesia. This has shaped Indian image and soft power at the global level and more so vis-à-vis Pakistan. The idea of secularism facilitated the coexistence of various religious and cultural communities and transmission values in India although it did not rule out conflicts on religious and cultural grounds. On the other hand, Pakistan has had witnessed many forms of governments since its inception and adopted ‘Islam’ as its official religion and ipso facto engendered more possibilities of insecurity for religious and cultural minorities. Kashmir, which India considers as its integral part is mostly populated by Muslims but it is consistent with its ideology of secularism and the fact of the presence of more Muslims on its territory than many predominantly Muslim-populated countries except Indonesia. India’s evolving image has contributed to overriding international support for its contention that Kashmir is a bilateral issue despite India’s first Prime Minister Jawaharlal Nehru internationalized the issue by taking it to the UN. Apart from the role of soft power, there are specific historical developments that went in favor of India’s claim that Kashmir is a bilateral issue. It is noteworthy that tribal incursions from the Pakistani side into the princely state of Kashmir following closely on the heels of partition led the then ruler of Kashmir Hari Singh to sign the Instrument of Accession-a legal document on 26 October 1947, agreeing to accede to the Dominion of India. Both India and Pakistan are signatories to the Simla Agreement of 1972 which maintained that Kashmir was a bilateral issue and must be resolved through bilateral negotiations and denied any space for third-party intervention. Even while Pakistan put forth the argument that the Simla agreement could not override the UN Security Council resolutions which mandated plebiscite and the resolutions recognized Kashmir as a disputed territory, many major actors of international politics such as the US, EU, Russia, Israel, Australia, Japan and China including Arab League have maintained neutrality over the Kashmir issue. Moreover, the UN Security Council removed Kashmir from its list of unresolved international disputes in 2010. India, for long, has alleged Pakistani involvement in the export of terrorism across the border to foment insurgency and chaos in Kashmir in order to provide a veneer of independence struggle to the continuing instability in the Valley. New Delhi has not only provided evidence of regular Pakistani involvement in cross-border terrorism in the form incursions and proxy wars across the Indo-Pak border, shreds of evidence are galore that the attacks into the Indian mainland from Mumbai terrorist attack to the attacks on the Indian Parliament onto the Pathankot and Uri attacks have involved Pakistani dirty hands. However, dealing with proxy wars raised by Pakistan has been a riddle evading any coherent policy responses from New Delhi. The surgical strikes failed to serve Indian intentions and the incidents of cross-border firings in violation of ceasefire agreement of 2003 kept bloating until Pakistan agreed to it. Pakistan, as a nuclear weapon state, is in an advantageous position to continue proxy wars and cross-border terrorism and therefore can keep Kashmir boiling with its nuclear threat while undermining India’s conventional military capacity. India’s claims that Kashmir is an integral part of India and it must be resolved bilaterally seem to be an oxymoron. Once New Delhi declared Kashmir as its integral part, it forestalled the possibilities of any discussions with any parties. It raises the questions like ‘who to talk to’ and ‘what to talk to’. Apart from all these complexities around Kashmir which so far remains an enigma, workable solutions need to be worked out in the interests of Kashmiri people (not in the interests of either India or Pakistan) which would serve the long-term interests of both India and Pakistan. Pakistan’s former President Pervez Musharraf’s ‘four-point formula’ can go a long way in achieving freedom for Kashmiris. It would not only deescalate the chances of conflict between India and Pakistan with both endorsing gradual or phased drawdown of their respective forces from the border areas, both countries need not alter their existing territories while both would allow greater freedom to Kashmiri population to move across the Line of Control (LOC) without any hindrances. India’s former Prime Minister Atal Bihari Vajpayee – who recently breathed his last – took concrete efforts to arrive at workable solutions to Kashmir conundrum. His famous ‘Lahore Bus Yatra’ and the ‘Agra Summit’ meeting between him and his Pakistani counterpart Musharraf pointed to the leader’s endeavor to bring peace in the Valley which turned into missed opportunities in the wake of Kargil war in 1999. It is pitiable that Kashmir which was once a home to cross-fertilization of cultures and religions has been witnessing unbridled radicalization and violence over the years. It is only by looking at Kashmir not as a piece of territory but as a land of suffering and tormented masses craving for more independence and mobility would set their house in order. Encouraging commercial and tourist activities in Kashmir by facilitating mobility among the people across the border would be beneficial not only to Kashmiris, it would also be in the long-term interests of both India and Pakistan. However, it remains a far-fetched idea in a world which is governed more by realist impulses than by liberal reasoning.